What do I need to know about Sealed VRLA battery charging? All lead-acid batteries release hydrogen from the negative plate and oxygen from the positive plate during charging. VRLA batteries have one-way, pressure-relief valves. Without the ability to retain pressure within the cells, hydrogen and oxygen would be lost to the atmosphere, eventually drying out the electrolyte and separators. Voltage is electrical pressure (energy per unit of charge). Charge (ampere-hours) is a quantity of electricity. Current (amperes) is electrical flow (charging speed). A battery can only store a certain quantity of electricity. The closer it gets to being fully charged, the slower it must be charged. Temperature also affects charging. If the right voltage is used for the temperature, a battery will accept charge at its ideal rate. If too much voltage is used, charge will be forced through the battery faster than it can be stored. Reactions other than the charging reaction also occur to transport this current through the battery—mainly gassing. Hydrogen and oxygen may be given off faster than the recombination reaction. This raises the pressure until the one-way, pressure-relief valve opens. The gas lost cannot be replaced. Any VRLA battery will dry out and fail prematurely if it experiences excessive overcharging. Note: It is too much voltage that initiates this problem, not too much charge — a battery can be “over-charged” (damaged by too much voltage) even though it is not fully “charged.” Never install any lead-acid battery in a sealed container or enclosure. Hydrogen gas must be allowed to escape. Why is charging voltage so critical to both Gel and sealed lead acid batteries? Charge voltage is critical on these types of batteries because they both are recombinant batteries. This means that the oxygen that is normally produced on the positive plate in all lead acid batteries recombines with the hydrogen given off by the negative plate. The “recombination” of hydrogen and oxygen produces water, which replaces the moisture in the battery. Therefore the battery is maintenance free and never needs watering. The sealing vent is critical to the performance of a sealed battery. The cell must maintain a positive internal pressure, otherwise the recombination of the gasses will not take place and the cell will dry out and not perform. In addition, the valve must safely release any excess pressure that may be produced during overcharging, otherwise the cell would be irreparably damaged. It is because of the safety mechanism of the valve that overcharging hurts a sealed battery. The excessive pressure that the valve is releasing is both hydrogen and oxygen. The more you overcharge a battery, there is less oxygen and hydrogen left inside the battery to recombine and create water. In essence, the battery dries out. It’s important to note that a sealed battery must never be opened once it leaves the factory. If opened, the cell loses its pressure, and the outside air will “poison” the plates and cause an imbalance that destroys the recombination chemistry. Hence the name: Sealed, Valve Regulated (SVR) Battery. The correct charging voltage for a Gel battery is 14.4 to 14.6 volts maximum at 68°F. The correct charging voltage for our Absorbed lead acid battery is 14.4 to 14.6 volts maximum at 68°F. What is the difference between Gel cell and starved electrolyte batteries? Both are recombinant batteries; both are sealed valve regulated. The major difference is that the “starved” or “absorbed electrolyte” battery contains an amount of liquid electrolyte added at the factory that soaks into the special separators. Therefore, it is non-spillable because all of the liquid electrolyte is trapped in the sponge like separator material. There is no “free” electrolyte to spill if tipped or punctured. Can I store my sealed battery in my garage during the winter or will it freeze? Both types of our sealed batteries can be stored in temperatures as low as -20°F without freezing provided the batteries are fully charged. Are your Gel batteries approved for air transportation? Yes. Most of our Gel batteries are approved for air transport by the FAA, IATA and the DOT. This information is stated on a label located on the battery. Do Sealed VRLA batteries have a "memory" like Ni-Cad batteries? One of the major disadvantages of nickel-cadmium (ni-cad) batteries is that after shallow discharge cycles, the unused portions of the electrodes “remember” the previous cycles and are unable to sustain the required discharge voltage beyond the depth of the previous cycles. The capacity is lost and can only be restored by slowly discharging completely (generally outside the application), and properly recharging. VRLA lead-acid batteries do not exhibit this capacity robbing effect known as memory. Why am I not getting the run time I expect from my new MK Gel batteries? Our Gel batteries are made with thicker plates than other batteries. It is because of these thick plates that we are able to get a longer cycle life from our Gel batteries. The downside is that it takes longer for all the material inside these plates to become active. It takes approximately 15-25 cycles to break the battery in. What are the advantages and disadvantages of both types of Sealed valve regulated batteries? Can I store my batteries on concrete? Many people have the impression that when batteries sit on concrete, energy “leaks out” or they are ruined. The short answer is that letting modern batteries sit on concrete does not harm or discharge them in any way. However, this legend is historically based in fact. The first lead-acid batteries consisted of glass cells that were enclosed in tar-lined wooden boxes. A damp concrete floor could cause the wood to swell, breaking the glass inside. The Edison cell (i.e. the nickel-iron battery) that preceded the rubber-cased battery was encased in steel. Those that weren’t isolated in crates would discharge into concrete quite easily. Later battery cases used primitive hardened rubber, which was somewhat porous and could contain lots of carbon. A moist concrete floor combined with the carbon in the battery cases could create electrical current between the cells, discharging them. None of this is a problem with modern batteries in their hard plastic shells. In fact, concrete is generally an excellent surface on which to place a battery. The electrolyte in a battery sitting on an extremely cold floor with very hot air around it could stratify, causing damage from sulfation; whereas concrete provides good thermal mass to buffer any temporarily extreme temperatures in the battery compartment. The appropriate charge voltage depends on the battery temperatures. A warmer battery requires a reduced voltage. If the voltage is not reduced, current accepted by the battery increases. When the current increases, the internal heating increases. This can rise to destructive levels if not taken into consideration. Temperature compensation monitoring at the battery — not at the charger. Limiting charging currents to appropriate levels. Allowing for adequate air circulation around the batteries. Using timers or ampere-hour counters. Using smart chargers that recognize the signature of a thermal runaway event which will shut the charger down. Can continual undercharging harm a Sealed VRLA battery? In many respects, undercharging is as harmful as overcharging. Keeping a battery in an undercharged condition allows the positive grids to corrode and the plates to shed, dramatically shortening life. Also, an undercharged battery must work harder than a fully charged battery, which contributes to short life as well. An undercharged battery has a greatly reduced capacity. It may easily be inadvertently over discharged and eventually damaged. What are the safety precautions for Sealed VRLA batteries? Although all valve-regulated batteries have the electrolyte immobilized within the cell, the electrical hazard associated with batteries still exists. Work performed on these batteries should be done with the tools and the protective equipment listed below. Valve-regulated battery installations should be supervised by personnel familiar with batteries and battery safety precautions. These batteries are sealed and contain no free flowing electrolyte. Under normal operating conditions, they do not present any acid danger. However, if the battery jar, case, or cover is damaged, acid could be present. Sulfuric acid is harmful to the skin and eyes. Flush affected area with water immediately and consult a physician if splashed in the eyes. Consult Safety Data Sheets (SDS) for additional precautions and first aid measures. Prohibit smoking and open flames, and avoid arcing in the immediate vicinity of the battery. Do not wear metallic objects, such as jewelry, while working on batteries. Do not store un-insulated tools in pockets or tool belt while working in vicinity of battery. Keep the top of the battery dry and clear of all tools and other foreign objects. Provide adequate ventilation as regulated by Federal, State and Local codes and follow recommended charging voltages. Extinguishing media: Class ABC extinguisher. Note: CO2 may be used but not directly on the cells due to thermal shock and potential cracking of cases. Never remove or tamper with pressure-relief valves. Warranty void if vent valve is removed. Can Sealed VRLA batteries be installed in sealed battery boxes? NO! Never install any type of battery in a completely sealed container. Although most of the normal gasses (oxygen and hydrogen) produced in a VRLA battery will be recombined and not escape, oxygen and hydrogen will escape from the battery in an overcharge condition (as is typical of any type battery). These potentially explosive gasses must be allowed to vent to the atmosphere and must never be trapped in a sealed battery box or tightly enclosed space! Does depth of discharge affect cycle life? Yes! The harder any battery has to work, the sooner it will fail. Avoid ultra-deep discharges. The definition of ultra-deep discharge may vary with application and battery type. Don’t leave a battery at a low stage of charge for an extended length of time. Charge a discharged battery as soon as possible. Don’t cycle a battery at a low state of charge without regularly recharging fully. Use the highest initial charging current available (up to 30% of the 20-hour capacity per hour) while staying within the proper temperature-compensated voltage range. Why do some Sealed VRLA batteries have a concave or convex appearance? The gas pressure in a VRLA battery can be lower than ambient pressure under certain circumstances. This partial vacuum will pull the container walls and cover inward. This may give the ends, sides of each cell, and tops of each cell a noticeable concave (inwardly dished) appearance. This is normal. The product is not defective. Its performance is not compromised in any way. In some situations charging will reduce or eliminate this appearance. Internal gas pressure being lower than external pressure has several potential causes that can operate alone or in combination. The recombination process continues after charging ends consuming most of the headspace oxygen — decreasing internal pressure. An increase in external pressure will result from a decrease in altitude. Cooling the battery reduces the internal gas pressure by contraction and also by causing some water vapor to return to liquid form. Severe discharging shrinks the volume of the internal materials. This leaves more volume for the gas to fill reducing the internal pressure. To prevent the permanent loss of gases so that recombination has time to take place, each cell can hold an internal gas pressure above external pressure before venting. Batteries with very large cells will slightly bulge as this normal pressure builds. This is especially noticeable at higher temperatures because the polypropylene case is more pliable when warm. Therefore, a certain amount of bulge is normal. If a battery bulges severely on charge, this is not normal. It is an indication of a blocked valve or an overcharge situation. Such a battery should be removed from service. How often should I charge? Charge daily. This applies to anyone who actually uses his or her equipment outside of the home. Always be sure to charge before an outing and always after active use. The ideal recharge point is about 50% on a scooter or wheelchair gauge. How do I charge my MK Batteries correctly? - Use the manufacturer’s automatic charger for all routine charging. - Never use an automotive or wet-type charger on Gel/sealed batteries. (They’ll quickly ruin your battery). - Never run your battery completely flat. - Don’t “top off” the battery with frequent charging. How should a battery be stored? - Always store your batteries FULLY CHARGED. - Check all batteries once a month and recharge as needed. - Wet batteries can hold their charge up to 3 months. - Sealed batteries can hold a charge for up to 6 months. - When storing a chair or scooter for more than 2 weeks, charge the batteries and then disconnect them. - Avoid hot and cold extremes when storing. Store batteries fully charged. Check them once a month and recharge as needed. Sealed batteries can hold their charge from 6 to 12 months. Remember, if storing your chair for longer than a couple of weeks, it’s best to charge the batteries and then disconnect them. I want to store my MK Gel batteries outside for the winter. At what temperature do the batteries freeze at? MK Gel batteries can be stored in sub-freezing temperatures as low as -25°F without freezing as long as they are fully charged prior to storage. The self-discharge rate of fully-charged batteries is so low in these conditions that they will not require charging for many months; however, if your Gel batteries are frozen … they will not always recover. 1) Bring them inside and let them sit at room temperature for two days. (They must reach 60°F). 2) Charge the batteries normally. (Follow standard safety procedures). 3) Run a capacity check either through a quality discharge tester or by operating your power wheelchair in a controlled environment. 4) If you don’t get enough run time then repeat steps 2 and 3. Do I have a battery problem or a charging problem? The Digital Voltmeter is still the most valuable tool in the Mobility Technician’s arsenal for sealed batteries. The starting point for checking batteries is always the charge voltage. In 24-volt systems we know the chances for two bad batteries are less than 1 in 10,000. So what we need to determine is WHICH battery is bad or if either battery is bad. This is accomplished by checking the voltage of each battery separately. Two batteries in a 24-volt system charge and discharge together almost as one 24-volt battery. A wide voltage separation between two batteries indicates that you may need to replace both batteries. If both batteries read similar voltage, they should be fully charged before doing any further testing. If both batteries are below 12.0 volts, the question becomes, “WHY?” Is the battery charger working correctly? Could there be a problem with the wiring or other components of the wheelchair? You can determine the next step in the troubleshooting process once you know the voltage of each battery. My batteries were over-discharged and my battery charger will not start. What do I do? Have you ever had a customer state that their batteries will not take a charge even though the charger was plugged in overnight? When you checked their batteries, you found that they both read 9 volts? This is usually due to a light or a brake being left on for an extended period of time, which drains the batteries. The reason why the charger is not working is that most wheelchair battery chargers need to read at least 21-22 volts in order to begin charging. This is how the polarity protection system of many chargers works. If the user were to hook up the positive and negative backwards, nothing would happen to the charger or the batteries because the batteries never read any voltage so it never started. The drawback to this polarity protection design is when a user over-discharges their batteries below the 21-22 volt cutoff. Although the charger is connected, it does not receive the signal to begin the charging process so the batteries never get charged. The best way to solve this problem is to remove the batteries from the wheelchair and charge each battery separately with a 12-volt battery charger. When each battery is fully charged, they can then be reinstalled in the chair and returned to service. Note: It may take the batteries up to 15 cycles to return to their former capacity if they have been severely discharged. What is the difference between a battery used for energy storage and an automotive battery? An automotive battery, also known as a Starting, Lighting and Ignition (SLI) battery is designed to start an engine with a quick burst of power (measured in cold cranking amps), and is constructed with thin plates. An energy storage battery is a deep cycle battery that has thick plates and is meant to provide a more constant or on-demand flow of current over a long period of time, and to be cycled on a daily basis. What is the best battery to use in an Energy Storage application? The specific parameters of each application vary, depending on environment, demand load, autonomy required, and many other factors. Sealed VRLA Gel or AGM, flooded monobloc, 2-volt systems or partial-state-of-charge batteries are all viable products in the Energy Storage space but selecting the right product for the right application is critical for overall performance and life of the battery. Why is a Gel battery more expensive than an AGM battery? The initial price difference is due to the more advanced separators used in a Gel battery, and the use of approximately 10% more electrolyte than in AGM. When considering total cost of ownership, a high-quality Gel product can actually be less expensive over the life of the battery since it can provide up to twice the cycle life, or more, of AGM. How often do I need to equalize my batteries? Flooded batteries usually need to be equalized once a month. VRLA batteries have no need for equalization when sized correctly and charged properly. Equalization for VRLA batteries is only needed when the batteries are not being charged correctly. What voltage do I set my inverter charger to? To ensure the highest degree of performance in a Renewable Energy battery system, the charging system must be set properly. Charging parameters vary based on the type of battery being utilized. Please consult the “Renewable Energy Charging Parameters” Technical Bulletin in the RESOURCES section of this website for specific recommendations on settings for inverters / charge controllers. What is the best inverter / charge controller to use? It is recommended that the inverter charger have programmable settings for bulk, absorption, float, and equalize voltage settings. The charger MUST also have a temperature compensation feature and an adjustable absorption time setting. What Amp Hour (Ah) rating should be used when choosing a battery? The Amp Hour (Ah) rating that is closest to the total run time should be used. Example: for a system design that has 3 days or less of autonomy, the 20Ah rating is commonly used. If the system design is being sized for 4 or more days of autonomy, the 100Ah rating is usually indicated. What is the maximum number of strings that I can put in parallel? For optimal performance, as few strings as possible should be designed into the system. No more than 6 strings is recommended though IEEE recommends less than 10 strings. Higher capacity batteries can be used to minimize the number of strings required. Do you offer a partial state of charge battery like lithium batteries? Yes - Please see the Energy Storage section of this website for information on the contact us for more information on the Ecoult UltraFlex AGM battery. What should I set the time limit for absorption on my charge controller / inverter? It is recommended to set the absorption time to the maximum time setting possible to take advantage of all available charging light regardless of time of year or weather issues. Using this method, the sun availability will determine the absorption time. Following this recommendation, there is no risk of overcharging if the battery charge voltage is set within the recommended voltage range. What is the difference between DoD (Depth of Discharge) and SoC (State of Charge)? DoD is the amount of energy removed from a battery during a discharge, where as SoC is the amount of energy remaining in a battery. Example: A battery at 70% DoD is at a 30% SoC. What is the difference between a standby application and a cyclic application? A standby application is one where a battery is used to support a specific load immediately should the utility supply fail. A typical application would be an Uninterruptable Power Supply (UPS). A cyclic application is one where a battery is discharged and charged on a regular and/or planned basis as a primary or secondary power source. A typical application would be an off-grid PV system. 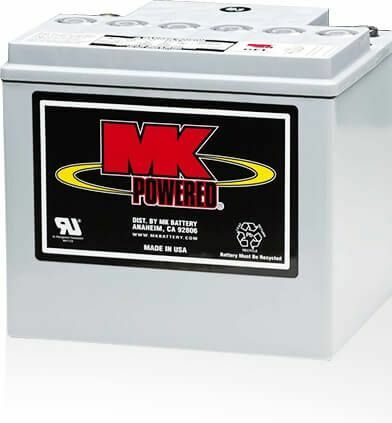 How often should I equalize my MK Gel batteries? As a battery is discharged, the cells with the lower voltage will be drained further than the cells at the higher voltage. As the same battery is charged, the cells with the high voltage will be fully charged before the cells with the lower voltage. The more a battery is cycled, the more the cell separation takes place. Equalizing batteries helps to bring all the cells of a battery to the same voltage. Our batteries are manufactured using Individual Plate Formation (IPF®) to activate the plates. This process guarantees a fully formed and voltage matched plate. The extra handling of the plates provides an additional inspection step in the process to verify plate quality. Plates from hundreds of batteries are formed in a tank all at once providing not only balance from cell to cell of a battery, but also balance from battery to battery of a batch. Don't I have to equalize my batteries to prevent stratification? When liquid electrolyte or acid stratifies, the heavier charged ions actually sink to the bottom of the cell, leaving discharged acid at the top. This allows the top of the plates to oxidize and corrode reducing performance and shortening life. The bottoms of the plates also corrode due to the action of the higher strength acid. This can happen in Stationary applications, such as the solar industry, because the battery never moves. Because our electrolyte is a thick-consistency gel, this acid stratification can never happen, so no, it is not necessary to equalize your MK Gel batteries.